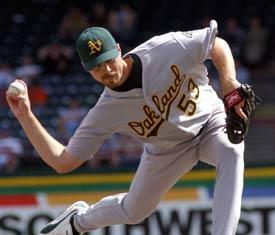 Chad Bradford and his Time-Fabric Wrinkling delivery will be back pitching for the Oakland A's possibly this weekend. He may not be that much better than the other options for the A's out of the bullpen right now, but you can't help but like the guy and enjoy watching him. The future is so bright right now, we gotta wear shades. Back Up Sucka, This One's for Allah! If someone comes up to me to start preaching some religion, the Mormons, the Scientologists, whoever, I immediately recoil and think, "Religious Nutjobs!" Pat Burrell said, "I don't think God's going to help me hit a fastball." Burrell's statement has offended some religious nutjobs, but he was just echoing the sentiments of Pedro Serrano in Major League, "Jobu no help me hit curveball." When a player points to the sky after a home run (Bonds) or a save (Dotel), I wonder what God thinks about that? Does God have a favorite team? Why would God have a favorite team anyway? Are some teams full of better people than other teams? Over the course of many seasons it would seem that any team would have it's share of good guys and bad guys. It seems like it would all balance out, a universal null sum game, where all the teams are equally loved by God. The teams that win aren't the ones pointing to the sky the most, they are just the best teams and/or the luckiest teams. It seems like statistics would govern baseball more than God, probabilities take over and who wins is the result of zillions of rolls of imaginary dice. The probabilty of getting a hit, a SB, a strikeout..there are enough statistics to measure how players will perform and then they go out and do it and the dice roll and they succeed or fail within the percentages of their abilities. The philosophical question is, "Who's rolling the dice?" It says in the Bible that God made man in his own image, but really man makes God in his own image. Although Einstein said, "God does not roll dice", I disagree. My God DOES roll dice, and he rolls them every time Nick Swisher gets to the plate, every time Zito throws a pitch. I'd guess Depodesta and Beane agree. They go try to get the best players they can on a budget, coach them as good as they can, and roll the dice. I'd hope my God is more focused on some real problems of our world than baseball games. How about war, murder, child abuse, man's inhumanity to man and nature, that kind of stuff. I am just not sure religion belongs in baseball. When religious nutjobs come up to me trying to sell me their religion, I always wonder why? Why do they care about me? The pesimist in me thinks they want my money to build them a nicer church, buy them a nicer church bus. The optimist in me, although still jaded, thinks maybe they want me to go to the heaven they are going to. Looking for people to add to the big party in the sky. No one ever trys to promote a religion where there is a God but no heaven, which to me is just as plausible as any other view on the universe. It could be something DID create this thing we are living in, but there are no Pearly Gates. Which get's to my religion. I AM the religious nutjob when it comes to the A's. I preach to everyone, even people at my work who know nothing of baseball, about the greatness of the Oakland A's. I am angered when all the national press ignores them, or dismisses them. I want to scream, "Don't you know, these are the CHOSEN ONES! How can you be blind about their GREATNESS? Don't you see that 5 consecutive years of 90 plus wins with a lower-than-average payroll is a MIRACLE?? How can you not BELIEVE?" Whether or not what I experienced was an According to Hoyle miracle is irrelevant. It's not the magnitude of the miracle, it could be something like the A's found my car keys, changed Coke into Pepsi, I felt their greatness and I can't go back. Some day I'll retire and move to Arizona or Hawaii. Baseball teams will come and go, but these last 5 years of the A's will always be in my mind the greatest years in baseball history. There were no World Series Championships, or even playoff series wins, but this team has been OTHERWORLDLY, and I want people to acknowledge it. And it is happening again, right now. As an A's fan, it is great to see Zito dominate. Last night the yellow hammers were dropping on the M's like mortar shells. The A's beat up Moyer pretty good. But I like Moyer. I am 39 and a half and there are 15 major leaguers older than me. The Mariners have 2 of those guys, Jamie Moyer and Pat Borders, the Giants have 2, Bonds and Jeff Fassero. I root for all 15 old guys, even Randy Johnson on the Yankees. But time waits for no one, and Moyer's time in the bigs is probably just about done. The M's are and usually have been a fun team to root for. Ichiro is the most ejoyable player to watch in the majors. Even the Boone is funny to watch, with his crazy huge whiffs and his occasional web gems and weird faces and big ears. And how can you not root for a pitcher with tatoos on his neck? As far as teams in the AL West, the M's are much easier to like than the Angels or the Rangers. But I root for the A's to crush the opposition, whoever they are. And they're not just playa's they crush a lot, lately. Hopefully the crushing will continue, but you kinda wonder if this is August's hot streak come early? The old moonshiner, Kendall, oughta be cheering up lately. He's probably thinkin', "Now THIS! This is kinda stuff I was hopin' for when I got outa the coal mines of Pittsburgh!" There will be moves. There are ALWAYS moves. And they always hurt a little, and help a lot. But how are we going to improve on 9-1 over the last 10? Maybe it's time to hold all the cards a little longer? That's the A's right now. I thought I was the optimist a week or so ago predicting the A's would be .500 by August 1st. The players say their goal now is .500 by the All Star Break. It might not take that long. It mathematically will take at least until July 2nd. I wouldn't trade ANYONE right now, they are all hot. Of course the rest of the country still hasn't noticed the A's. But they will.